CUSTOMIZE YOUR EYES COLLECTION caught my eye the second it launched. I always say I believe in love at first sight when it comes to Dolce&Gabbana sunglasses. And last year it happened with their Sicilian Carretto collection. 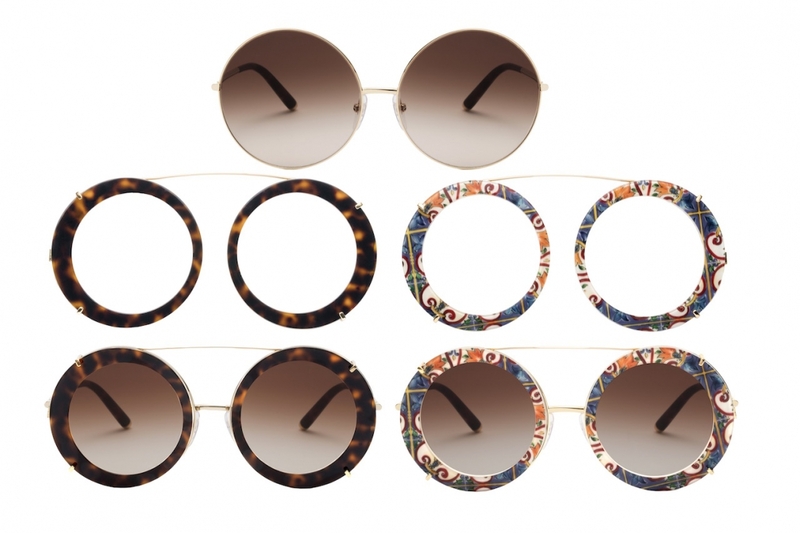 But now we go round and round with these rounded sunnies that can change whenever you feel like it. These models mix designs so you can wear colorful sunnies and then change them into a simpler look. Always loyal to a Mediterranean vibe, leopard print, and florals, Dolce&Gabbana has made these 3 models that come with an option 2 (clip-ons). Floral decor and refined majolica, leopard print with burgundy, and the Italian ceramics the designers have always had as a base. These are my favourite pair probably. The golden and ceramic pattern ones are perfect for summer and the turtle/havanna ones are just my style for any season of the year. The colorful pattern from Sicilian majolica is the statement you need for any simple outfit, or even bold ones. The brown havana is perfect for any officewear and stylish looks too. One for the flower lovers and the classy ones. I really like the floral and stripes pattern though I would only wear it with total black outfits. However I find the black one super classy and wearable for any occasion. It looks a lot like my most worn sunnies by Miu Miu.